Last week, Retail Sales raised eyebrows as the December release came in with a horrendous print. Taking a step back and looking at sales from a global scale, though, US retail sales are still fairly strong compared to the other 23 major economies that we track through our Global Macro Dashboard. With a y/y growth rate of 2.3%, the indicator has a little bit of headroom above the average global rate of 2.16% and a full percentage point above the median global growth rate. 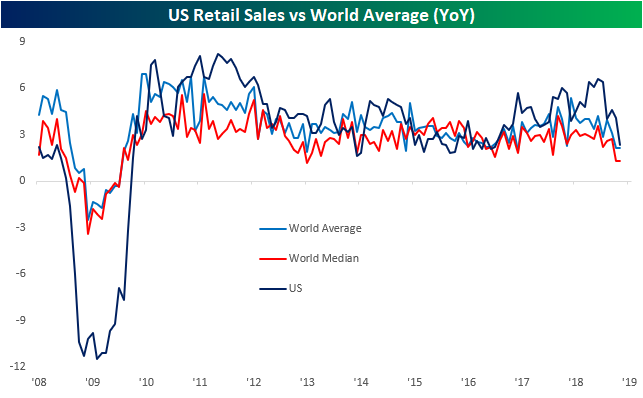 In other words, while the December print wasn’t great—reasons to be suspect of the most recent data (see here and here) aside—and the indicator has been trending downwards in recent months, US Retail Sales are growing at a faster rate than 14 of the 23 global economies in our Dashboard. Of the developed economies tracked, the US actually has the fourth fastest growing retail sales behind the UK, France, and Australia, while the rest of the countries with faster growth are all emerging markets. Meanwhile, 5 of the countries in our Dashboard have actually seen contractions in their most recent y/y retail sales reading.